Product prices and availability are accurate as of 2019-01-13 11:04:40 EST and are subject to change. Any price and availability information displayed on http://www.amazon.com/ at the time of purchase will apply to the purchase of this product. 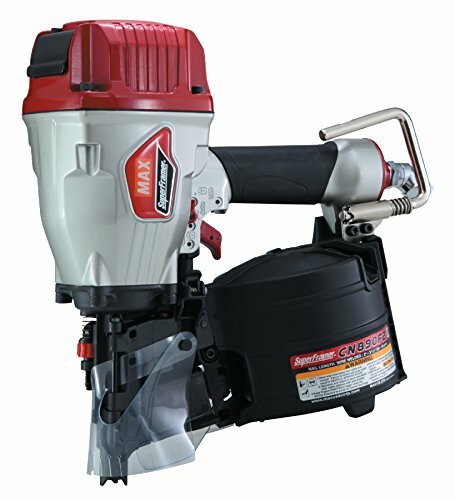 The Max USA Corp CN890F2 super framer coil framing nailer is a lightweight powerhouse. At only 7.7Lbs, with a driving power of 1,060 inch lbs it can stand up to any job. The short height design allows for easy access in tight spaces. The CN890F2 has a maintenance free end cap filter that keeps the internals of the tool clean, an easy load magazine, dial adjustable depth control, an aggressive nose for Toe nailing, and a comfortable rubber grip. The CN890F2 also comes with a rafter hook, and a swivel plug.